The game of poker is centred around the act of betting. 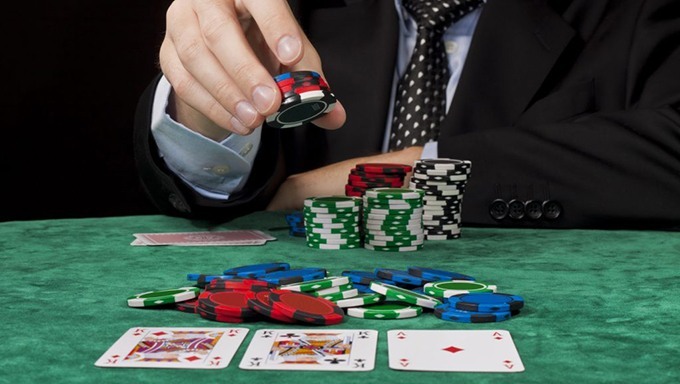 In a standard game there are four rounds of betting – the pre-flop, flop, turn and river – and five different betting actions that players can choose from at each stage: checking, betting, calling, raising and folding. Betting determines how much money goes into the pot and how much you can win, so the skill of judging when and how much to bet is vital to helping you win more hands and minimise the damage when you do not win. Poor bet sizing – whether it is betting too much or too little – is a common mistake in novice players and can be very costly. The size of your bet should be determined by the situation at the table and the action that you want to draw from your opponents. The size of a bet is always measured relative to what is in the pot, and players should adjust their bets according to the size of the pot. A small bet is generally considered as being equal to half the pot or less, a medium is between half and three quarters, and a big bet is defined as anything above three quarters. A standard pre-flop bet is three times the big blind, but in some cases it can be better to bet more. If lots of players enter the hand, betting big will see off a few opponents and give you a better idea of the strength of the other players’ hands. Remember, the fewer opponents the better. Anyone who wants to stay in the hand will have to raise their betting, so the size of the pot will naturally grow significantly. Another type of bet that you might come across is a continuation bet. This is when you bet before the flop because you had a good hand, then continue betting when the flop is no good to maintain the impression that your hand is strong. It is often thought that continuation bets only need to be small in order to pull it off, but in games with big stacks, a small bet will often get called. If you possess a drawing hand as opposed to a made hand, you need to decide whether it is worth chasing the draw and, if so, how much to bet. This depends on two factors: how many outs you have to get to the likely winning hand, and how big the pot is or is going to be. This involves a bit of mathematics: calculating how many outs you have, the pot odds and the implied odds. The more outs you have (eight or more is a good number), the bigger you can bet and, likewise, if the pot odds are good then it is best to keep playing. What Impression Are You Giving? You also need to consider what your betting pattern says to the other players. Inexperienced players often bet big with strong hands and small with weak hands, but after a while this can get predictable. There are two other approaches that can keep your opponents guessing: randomly varying the size of your betting or staying consistent throughout. Both have the aim of making it as difficult as possible for your opponents to read you, which will improve the chances of your bluffs being successful. Finally, how much you bet is influenced by what action you want to elicit from opponents. There are two simple rules to consider here. If your aim is for your opponent to fold, then you want to achieve this with the smallest bet possible. You will be risking fewer chips in the event you are called, and most players fold to a smaller bet just as often as they do to a full-pot bet. On the other hand, if your objective is a call, then the opposite applies. Making a bet that you want to get called is known as a value bet, but sometimes you are better off making a bigger bet that is less likely to get called than a lower bet that is more likely to get called, as you will gain more from it. As with everything in poker, bet sizing is all a matter of judging the situation, your goal and your opponents. Go start making the right bets by visiting William Hill Poker today! Every online gambler deserves a safe and fair place to play. Our mission at Gambling.com is to create a safe online environment for players through free, impartial and independent reviews of New Zealand's best online gambling companies so that you can play with confidence and security. All ratings and reviews are made independently of the operator by our team of gaming experts and with every company being fully licensed they can be trusted to offer fair play. We accept compensation from the companies advertised on this page and this may affect the brand positioning. We endeavour to continuously update this list so we can bring you the most current sites and the best available offers but we cannot review every site in the market. €365 bonus is redeemed in instalments based on Status Points earned. Tickets and prize wheel spins expire after seven days. Time limits, exclusions and T&Cs apply. For more information about this offer please visit the website.